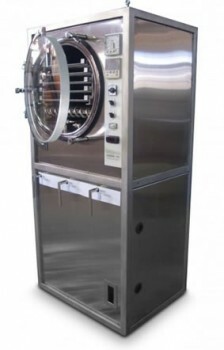 The FD5.5 is the smallest freeze dryer produced by Cuddon Freeze Dry, and is a popular pilot scale model often used for research and development in laboratories or larger commercial operations. The FD5.5 is lightweight, totally enclosed, vertical in design, and is mounted on castor wheels to enable easy manoeuvrability. The small footprint of the FD5.5 freeze dryer requires a minimum space of only 900mm(W) x 900(D) x 2000(H). The FD5.5 offers accessible entry and coupled with Cuddon Freeze Dry's buyback programme, reduces risk and capital outlay for organisations wishing to develop their own freeze drying capability. Chamber – Over all dimensions 900mm wide x 762mm deep x 1863mm high. Contact us now about your freeze dry enquiry.